Distribute analog video signals from a single A/V source to multiple televisions, monitors and receivers. Daisychain amplifiers together for an unlimited number of television connections without degridation to the picture quality. This 4-output distribution amp supports cable runs up to 150 ft. Unity gain ensures that the output signal is as clean as the input signal. High-quality and stable amplification eliminates the poor picture and sound quality you get by simply using Y-cables. Use these amplifiers with video sources like DVD players, satellite receivers and other video sources. Also useful for distributing audio sources like CD players and tuners for multi-zone sound systems. 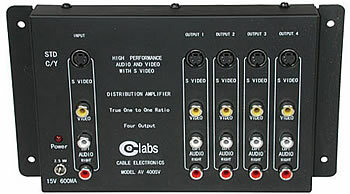 One A/V input, including S-Video and composite video to four outputs. Cable runs up to 150 feet are not a problem and multiple amplifiers can be daisy-chained together for a nearly unlimited number of display connections. These distribution amplifiers are ideal for all home theater, boardroom, nightclub, sports-bar and school applications. The uses are endless! Send composite video and audio to multiple output devices! Distribute analog video signals from a single A/V source to multiple televisions, monitors and receivers with this powerful distribution amp. Supporting cable runs up to 150ft, these amps can be daisychained together for an unlimited number of television connections without degradation to the picture quality. Unity gain technology ensures that the output signal is as clean as the input signal. High-quality and stable amplification to eliminate the poor picture and sound quality you get by simply using Y-cables. Use these amplifiers with video sources like DVD players, satellite receivers and other video sources. Also useful for distributing audio sources like CD players and tuners for multi-zone sound systems. Perfect for nightclubs, banks, airports, boardrooms, and schools. The uses are endless! Distribution Amplifiers are specifically designed to deliver the high-quality video and sound that customers demand and expect. Unity gain ensures that the output signal is virtually identical to the input signal.